Rocky Ford and warmwater fishing in the basin have been our go-to's this year with prolonged high water on the Yakima. Our guides have run a number of trips on Rocky Ford over the past several weeks, with the fishing being a hit, or miss, depending on the day and the conditions. Today was definitely one of the "hit" days. With little to no wind, sight-fishing small (#16-18)olive and orange scuds and BWO nymphs was productive throughout the day. 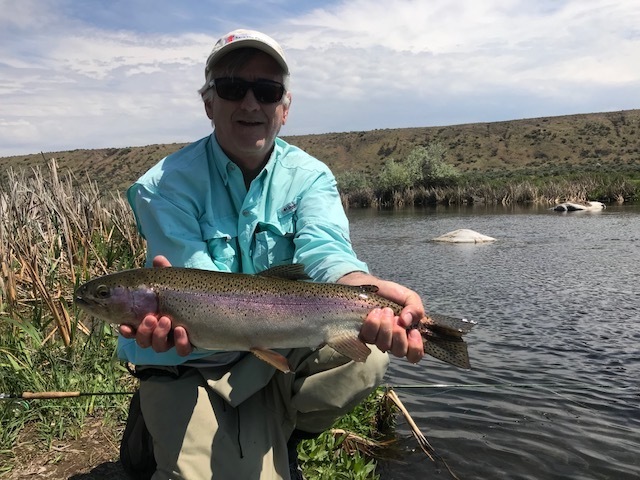 Having the opportunity to sight-fish small flies to big fish is one of the many reasons why anglers choose to return to this oftentimes challenging spring creek throughout the year. Although there was not much hatch activity today, we did see evidence of a few Callibaetis spinners, so make sure to have along some tan parachute patterns as well as a few Hare's Ear cripples in #14-16 to match these medium-sized mayflies. There have not been many reports of people doing exceptionally well on streamers, but a cloudy day could produce a good streamer bite on bunny leeches in olive, white or a combination of both. If you are tired of waiting for the Yak to come back into shape, rocky Ford is a great option, and is never blown out. It's spring, go fish!